Migraine is a debilitating neurological condition associated with symptoms including: intense pressure in the head, nausea, blurred vision, vomiting, and extreme sensitivity to light, sound, touch and smell.11 Migraine disorder, wherein an individual suffers from a migraine episode at a minimum of two times per month, affects approximately 12% of the population of the United States.1 When an individual suffers from a migraine episode, their mental and physical capabilities are inhibited, making daily tasks extraordinarily challenging, if not impossible. Migraines cause normal neurotransmission – communication between neurons – to be disrupted, and the role of the central nervous system becomes compromised. Treatment options are limited and often ineffective thus exploration of new treatment options would greatly benefit migraine sufferers. 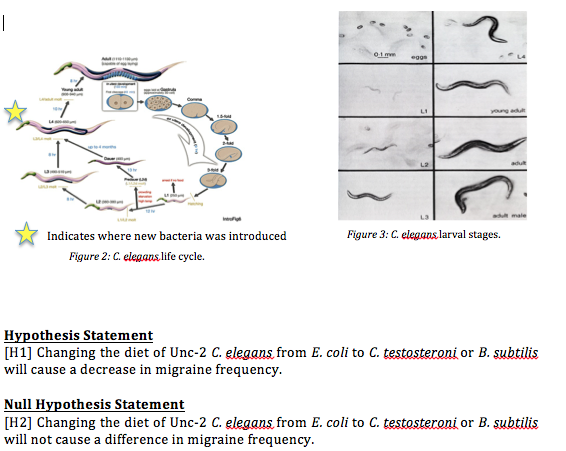 The goal of this investigation was to explore the potential relationship between migraine disorder and diet using the model organism C. elegans. The Unc-2 C. elegans genotype is known to mimic human migraine disorder; every abrupt directional change in an Unc-2 C. elegans organism is equivalent to a human migraine. C. elegans consume bacteria as their primary source of nutrition, thus two strains of C. elegans, wildtype (N2) and Unc-2, were fed one of three different bacterial strains and their behavior was observed for one minute. This procedure was repeated three times for each organism. Based on the data collected, it can be concluded that Unc-2 C. elegans grown on a diet of either Comamonas testosteroni (C. testosteroni) or Bacillus subtilis (B. subtilis) experienced a decrease in migraine frequency as compared to those grown on Escherichia coli (E. coli). C. elegans is an incredibly versatile and popular model organism used to explore human neurological disorders. The organism is a 1mm long transparent nematode that grows and survives on bacteria. The Unc-2 genotype of C. elegans has been genetically manipulated to model human migraine disorder. Similar to the pathogenesis in humans, the Unc-2 mutation has been identified to cause an increase in serotonin neurotransmitter release in C. elegans. This manifests itself as a high frequency of abrupt changes in movement and direction for migraine disordered Unc-2 C. elegans. As there is an indicated link between poor diet and migraine disorder, this investigation explored the relationship between nutrient consumption and the frequency of migraine occurrences.6 C. elegans traditionally feed on E. coli. For this investigation, migraine-disordered Unc-2 C. elegans were cultured on three bacteria-types: E. coli, B. subtilis, and C. testosteroni. The frequency of migraine occurrences experienced by the C. elegans grown on different bacteria was compared and analyzed. Unc-2 and N2 C. elegans were grown on E. coli until they reached the L4 larval stage of development (Figure 1 and Figure 2). The food source of the L4 C. elegans was then switched to either B. subtilis or C. testosteroni and the organism was allowed to mature to adulthood (Figure 1). Migraine frequency was analyzed for C. elegans in the adult larval stage. The implications from this investigation may have significance for migraine disorder patients as increasingly more neurological disorders are being linked to diet and an unhealthy microbiome.4,5,6 Discovering whether or not certain diets impact migraine disorder would indicate reason for further study concerning possibly treatment for migraine disorder sufferers. 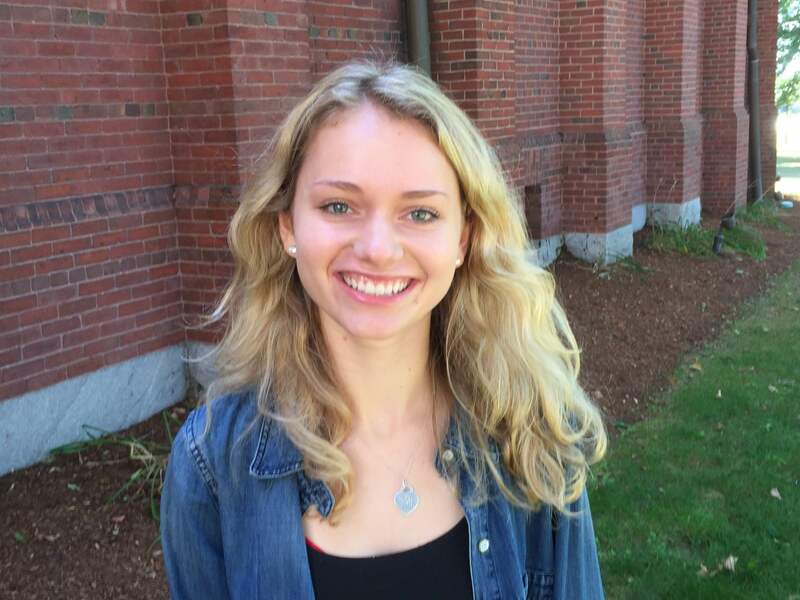 The goal of this investigation was to determine the effect of diet on migraine frequency. A better understanding of the relationship between diet and migraine genesis may allow those who suffer from migraine disorder to better control their symptoms. 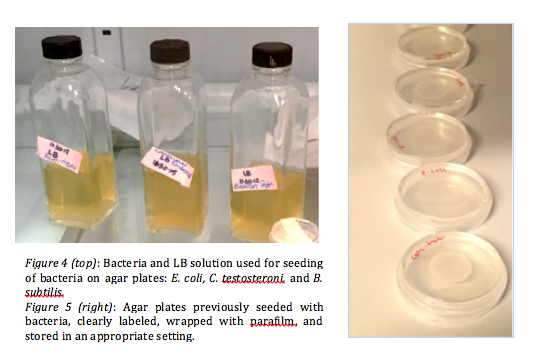 Cultured bacteria on agar plates: The agar plates and the bottles containing the bacteria solutions were first sterilized using the bunsen burner. Using a disposable pipet, a small amount of bacteria solution was then transferred onto an accurately labeled agar plate. Prepared for data collection by introducing L4 C. elegans grown on E. coli to either C. testosteroni or B. subtilis: L4 stage C. elegans were picked onto bacteria to prepare for experimentation once they had matured to the adult larval stage. 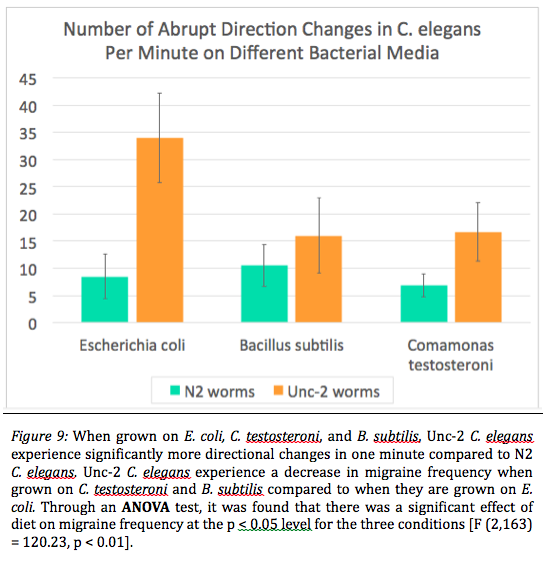 Data collection for abrupt directional changes in N2 and Unc-2 C. elegans grown on E. coli, C. testosteroni, and B. subtilis independently: migraines, or abrupt directional changes, for the C. elegans were observed under a microscope for one minute trails and recorded using a counter. 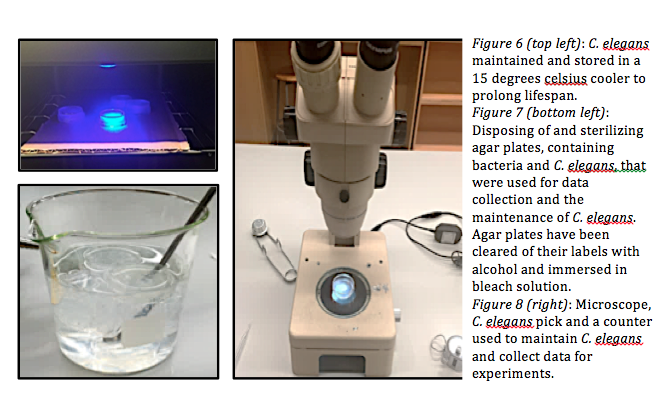 Disposing of used agar, bacteria, and C. elegans plates: C. elegans and bacteria agar plates were submerged into a diluted bleach solution. The bleach solution served to sterilize the agar plates in preparation for disposal. Performed statistical analysis to determine if differences were significant: averaging, standard deviation analysis, ANOVA (one-way) and Post-Hoc Tukey HSD tests were performed to analyze the data collected for C. elegans. 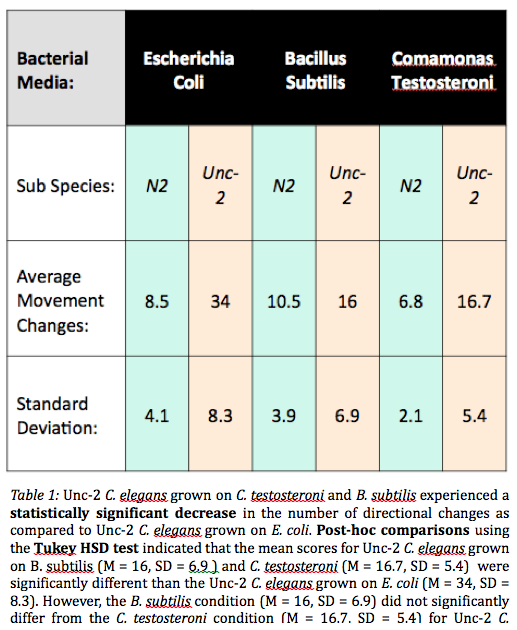 When grown on E. coli, C. testosteroni, and B. subtilis, Unc-2 C. elegans experience significantly more directional changes in one minute compared to N2 C. elegans (Table 1, Figure 9, and Figure 10). Unc-2 C. elegans experience a decrease in migraine frequency when grown on C. testosteroni and B. subtilis compared to when they are grown on E. coli (Table 1 and Figure 9). Through averaging and standard deviation analysis, Unc-2 C. elegans grown independently on C. testosteroni and B. subtilis experience a decrease in migraine frequency, with respect to Unc-2 C. elegans grown on E. coli (Table 1 and Figure 9). An analysis of variance (one-way) test, or ANOVA test, found that there was a significant effect of diet on migraine frequency at the p < 0.05 level for the three conditions [F (2,163) = 120.23, p < 0.01]. The results from this investigation support the hypothesis that changing the diet of Unc-2 C. elegans from E. coli to C. testosteroni or B. subtilis causes a decrease in migraine frequency. Unc-2 C. elegans experience significantly less directional changes, or migraines, per minute when grown on C. testosteroni and B. subtilis compared to when they are grown on E. coli. Through averaging of the data collected in Table 1 and standard deviation analysis, it was found that Unc-2 C. elegans grown on E. coli have an average of 34 directional changes per minute with a standard deviation of 8.3. Unc-2 C. elegans grown on C. testosteroni have an average of 16.7 directional changes per minute with a standard deviation of 5.4, while B. subtilis grown Unc-2 C. elegans have an average of 16 directional changes per minute with a standard deviation of 6.9. Thus, Unc-2 C. elegans grown on C. testosteroni and B. subtilis experienced a statistically significant decrease in the number of directional changes as compared to Unc-2 C. elegans grown on E. coli (Table 1 and Figure 9). An analysis of variance (one-way), or ANOVA, test found that there was a significant effect of diet on migraine frequency at the p < 0.05 level for the three conditions [F (2,163) = 120.23, p < 0.01]. The ANOVA test further disproves the null hypothesis that changing the diet of Unc-2 C. elegans from E. coli to C. testosteroni or B. subtilis will not cause a difference in migraine frequency. While the ANOVA test proved that there was a significant difference between groups, further analysis was necessary to identify the specific differences between groups. Post-hoc comparisons using the Tukey HSD test indicated that the mean scores for Unc-2 C. elegans grown on B. subtilis (M = 16, SD = 6.9 ) and C. testosteroni (M = 16.7, SD = 5.4) were significantly different than the Unc-2 C. elegans grown on E. coli (M = 34, SD = 8.3). However, the B. subtilis condition (M = 16, SD = 6.9) did not significantly differ from the C. testosteroni condition (M = 16.7, SD = 5.4) for Unc-2 C. elegans. Future investigation could include exploring the causation of B. subtilis and C. testosteroni’s impact on the Unc-2 C. elegans behavior. It would be important to determine if B. subtilis and C. testosteroni directly cause a decrease in migraine occurrences or if, conversely, E. coli causes an increase in migraine frequency for Unc-2 C. elegans. Research confirms that different bacteria types have varying levels of components and can lead to different biological changes in consumers.12 Looking closely at the synthesis of bacteria types, in relation to migraine behavior, could extend the implications of the impact of diet on migraine disorder. One avenue of exploration would be to more deeply explore the relationship between the GABA, lactose, or B12 components of the bacteria and determine whether or not those components contribute to the causation of a decrease in migraine frequency. Additionally, N2 and Unc-2 C. elegans could be grown on different bacteria types to identify other diets that may impact the behavior of migraines. Cain, S. M., & Snutch, T. P. (2011). Voltage-Gated Calcium Channels and Disease. Pietrobon, D. (n.d.). Cav2.1 Channelopathies. Springer, 375-390. Estevez, M., MD, PhD. (2006). 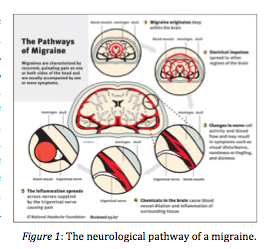 Invertebrate Modeling of a Migraine Channelopathy. bacterial diet. Worm, 2(4), e1-1-e1-4. Retrieved from Taylor and Francis Online database.